Things have been a bit slow on fashion lane since the new year arrived. But it’s normal for people, celebs included, to remain in a chilled, holiday mode for the first few weeks of the year. Save for the first ever Film Gala which happened in Victoria Island, Lagos, the Nigerian fashion scene was without much action this past weekend; but not for the women on this list though. 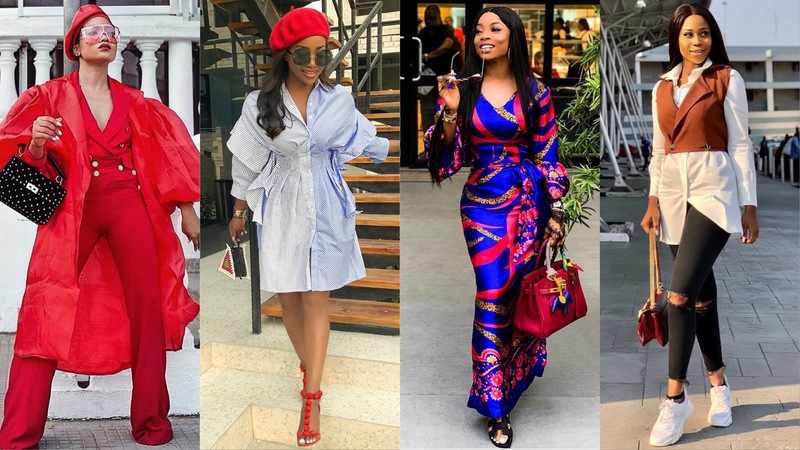 These looks from some of your favourite celebrities, socialites and influencers can be interpreted as fancy and plush. TM Luxury brand owner, Toke Makinwa sure knows how to take things down multiple notches when she needs to. The Mogul dressed down over the weekend and made it very clear that she could look great even when she’s not too glammed up. On-air personality and media girl, Stephanie Coker wore a cream bubble dress with a high pleat neckline that left her looking as youthful as ever. Good Hair Ltd co-founder, Chioma Ikokwu who recently shared inspiring news of her latest property acquisition in Ikoyi, stepped out channelling a bit of the Parisian spirit into her look. Her outfit was perfect by Parisienne blogger standards and by ours. Actress Lilian Afegbai opted for a casual but very chic outfit sporty look that easily won us over. Media girl Omowunmi Onalaja stepped out in this effortless denim and cool blouse look that scored major points in our books. Socialite Nimi Nwafor channelled Lady Gaga as she posed in this voluminous ruffle number with matching accessories, and we love! Creative director and style influencer, Jennifer ‘The Lady Vhodka’ Oseh surely know how to make a splash. And this she did as she pulled a hot red monochrome look in a blazer, pants and organza jacket ensemble. With a beret and red lippie to match, hers was literally the look to beat this past weekend. Actress and new landlady, Linda Osifo takes pride in wearing the most unconventional colour combinations and somehow it always works well for her.